Do you really want to invest in a company that pays out more than it takes in? Investors have for centuries flocked to large-cap stocks with histories of returning profits to shareholders. Many of America's largest publicly traded companies continue to reward loyal shareholders with billions of dollars of dividends and stock buybacks each year. Many of these shareholder favorites are part of the Dow Jones Industrial Average (DJINDICES:^DJI), which tracks a number of of America's largest and most profitable public companies. All told, the Dow's 30 components have returned $292 billion to shareholders, in the form of dividends and buybacks, over the past four quarters. That's nearly enough to give every man, woman, and child in the United States $1,000 -- but those rewards flowed only to the investors savvy enough to own shares in these blue-chip companies. Some Dow components have been savvier than others about managing their shareholder returns: only 13 of the Dow's 30 components paid out less than 100% of their free cash flow as distributions or buybacks over the past year. Even then, few kept much in reserve -- Verizon (NYSE:VZ), which paid out the least in relation to its free cash flow, is the only non-bank Dow component to return significantly less than half of its free cash flow to shareholders. Second best was United Technologies (NYSE:UTX), while Intel (NASDAQ:INTC)was the last of the three non-bank Dow stocks to return less than two-thirds of its free cash flow to shareholders over the past year. Why does this matter? When a company pays out more than its total free cash flow to shareholders, it's essentially saying "we don't need this money, and we can make more when we need it." As the financial crisis of 2008 demonstrated, the line between easy money and dire straits is thinner than many companies would like to admit. Keeping at least some free cash flow in reserve can help companies -- even those as durable as the Dow's 30 -- survive troubles without depleting hard-earned reserves. Let's look at the three non-bank Dow stocks that have the best control over their cash flow today. At the end of this article, you'll find a table ranking all 30 Dow components by the percentage of free cash flow they've paid out to shareholders over the past year. 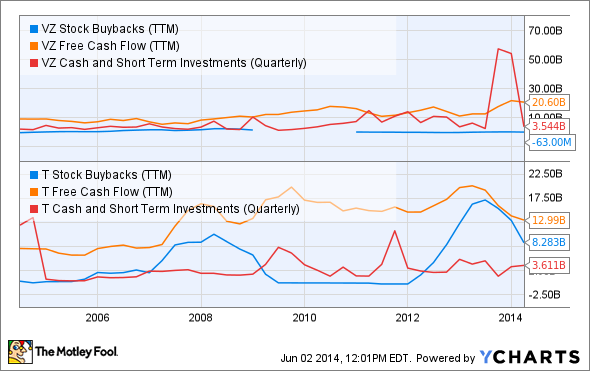 INTC Stock Buybacks (TTM) data by YCharts. 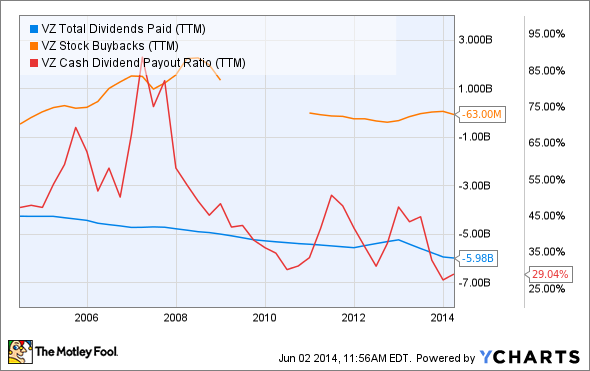 INTC Total Dividends Paid (TTM) data by YCharts. 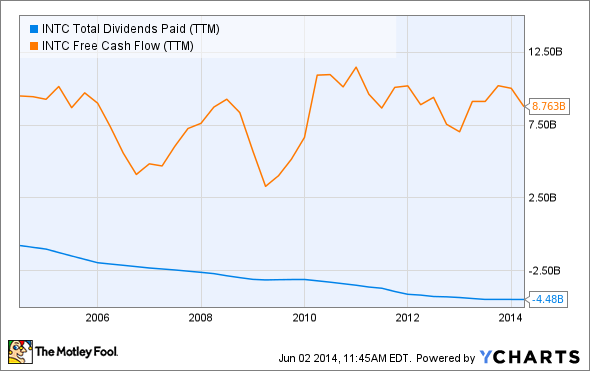 UTX Total Dividends Paid (TTM) data by YCharts. 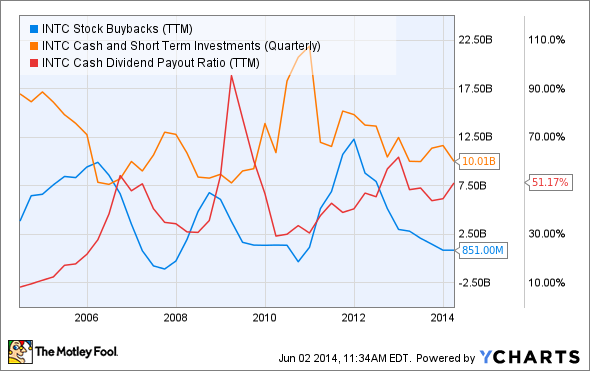 UTX Stock Buybacks (TTM) data by YCharts. 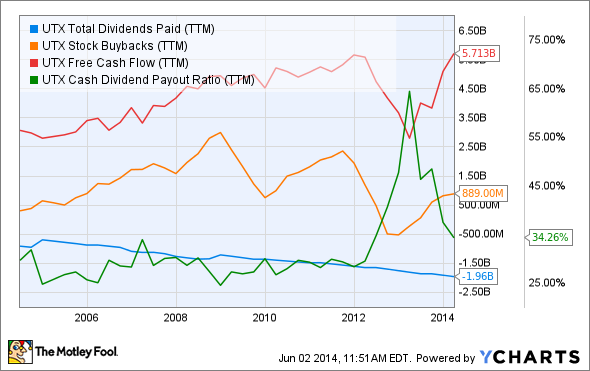 VZ Total Dividends Paid (TTM) data by YCharts. 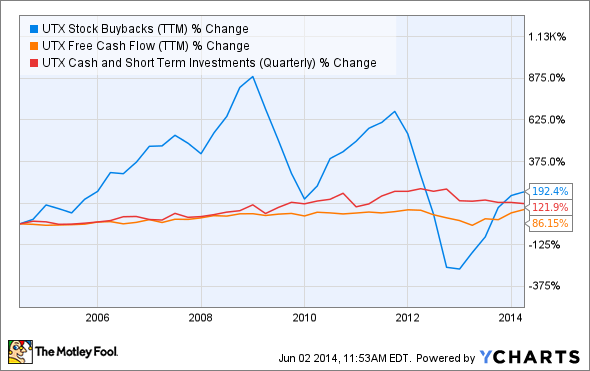 VZ Stock Buybacks (TTM) data by YCharts. Source: YCharts. Dollar results in billions, on a trailing 12-month basis.